The marriage God has for you may not be the one you are in right now! No, I am not talking about leaving; I am talking about cleaving. What He has is greater than your vision, your past, your hurts, what you have right now, or even what you think you want. The world tells us that being in love virtually guarantees a perfect marriage; this idea encourages us to follow our hearts. Is this true? Does this work? Is it biblical? Are we ready to really follow our hearts? Does the heart’s desire equal what is best? Is there something we can do to help our heart be content and not be led into what is false or dysfunctional? What about my heart? Because our hearts are corrupted with sin and can lead us to what is false, actions based on the heart alone can result in indecision, unpredictability, inconsistency, shallow, and ever-changing desires that lead us in multiple wrong directions and blind us to what is better and more fulfilling. So, how will we be led in the right direction (Psalm 37:4; Proverbs 23:7; 27:19; Matthew 15:19)? The call to Love one another applies first and foremost to your spouse. This means sacrificial, unselfish, determined love; the change Jesus makes in John 13 is from “neighbor” to “one another” to make sure the theme is community. Our change is from seeing our spouse as the opponent to the partner, from the problem to the focus of our love. Love confirms the genuineness of Jesus and us as followers! This is also a template on the importance and value of friendships and building an effective church! The prime purpose of marriage is to grow us closer to the love and the Person of Christ and His Likeness. 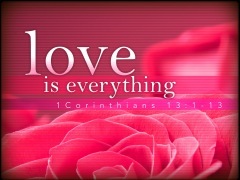 The call to Love one another is Agape, which means “self giving” and “sacrificial”. Agape love is more concerned with others than self. We are to be more concerned with our spouse than ourselves. What would your marriage look like when you are pursuing love in the midst of your toil? How is this the irrefutable mark of a true follower of Jesus Christ? Do you know that your justification in Christ is sealed and more valuable than you will ever know? How does this affect your righteousness and purity? How will this build your marriage? When we love one another, we prove and exhibit Christ! The marriage God has for you may not be the one you are in right now! No, I am not talking about leaving; I am talking about cleaving. What He has is greater than your vision, your past, your hurts, what you have right now, or even what you think you want. The world tells us that being in love virtually guarantees a perfect marriage; this idea encourages us to follow our hearts. Is this true? Does this work? Is it biblical? 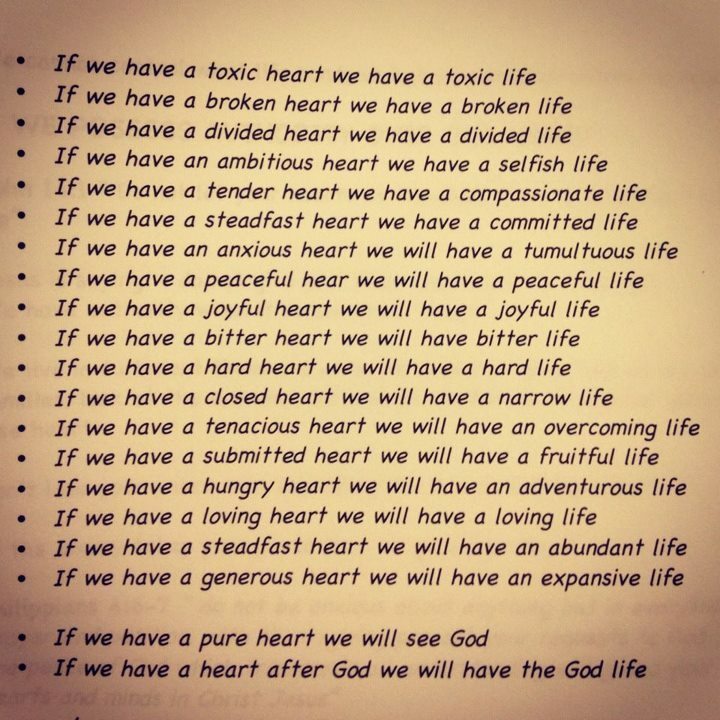 Are we ready to really follow our hearts? Does the heart’s desire equal what is best? Is there something we can do to help our heart be content and not be led into what is false or dysfunctional? Because our hearts are corrupted with sin and can lead us to what is false, actions based on the heart alone can result in indecision, unpredictability, inconsistency, shallow, and ever-changing desires that lead us in multiple wrong directions and blind us to what is better and more fulfilling. So, how will we be led in the right direction (Psalm 37:4; Proverbs 23:7; 27:19; Matthew 15:19)?